March | 2011 | Better Offer? With what seems like a very long winter finally making way for the onset of spring, it was time to make a start on the garden. And as we have been blessed with some wonderfully dry weather recently I decided the grass could do with its first cut of the New Year. A full two weeks earlier than last year! I’m not going to go into the struggles with the first cut, as it is pretty much the same as I wrote last year (see “The First Cut…“). The only thing I will add is that I had to cut it twice in 48 hours – the first cut gave it a good trim, but it was still very damp and therefore looked quite messy. Leaving it for a full day in between cuts allowed the now shorter grass to dry that bit more and the second cut cleared all the debris left following the first as well as trimming to a very acceptable length. Now I’ll leave it at least a week before attacking it again! Whilst I was working up a sweat thirst pushing and pulling the lawn mower round the garden, She Who Must Be Obeyed tackled the forest of dead plant life which had mysteriously appeared where the gorgeous colours of last year’s spring and summer seasons once proudly adorned the garden. And with all her hacking, sorry pruning, we began to see the first colour of spring. And that colour was yellow. 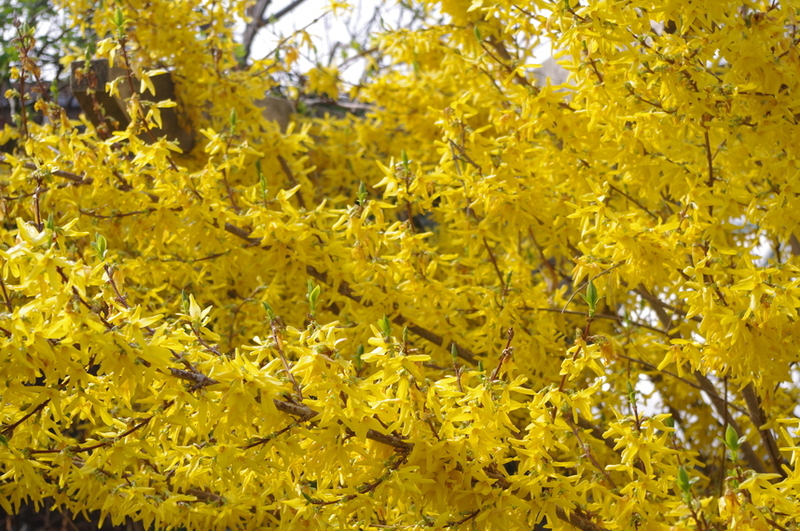 Firstly there was the beautifully full and bursting with colour forsythia bush. Then there was a handful of daffodils. But more worryingly, was the carpet of dandelions. And whilst their colour was as vivid as the forsythia and the daffs, their presence was certainly most unwelcome. I decided it was time to wage a war against these pests and decapitated more than 100 of them. They may have looked lovely with their little yellow heads beaming in the sunshine, but I knew once I turned my back they would shed their colour and launch tiny fluffy white seed pods into the air. These would then settle around the garden and would in turn sprout later in the year. I would have this carpet of yellow weeds all summer long and that is something I definitely do not want. So, feeling like an executioner, I held up my basket of heads expecting cheers from the crowd, but then I realised, She Who Must Be Obeyed was no longer in the garden. It was just me and the cats, and they couldn’t care less! As I stood there surveying the once yellow carpet, I wondered what to do with those heads. 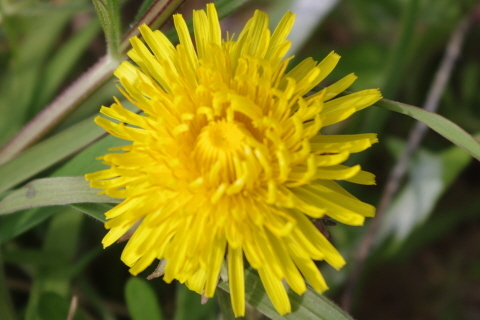 I knew that many people use dandelions in recipes and thought should I give it a go. But then I thought again and tossed them with the rest of the garden rubbish! 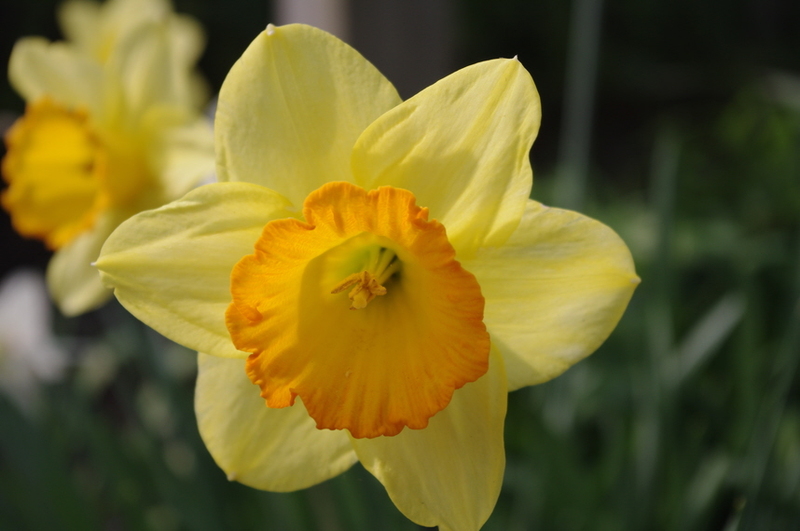 The following morning I went into the garden to take a photo of the forsythia and daffodils for this post and to my horror at least another 20 dandelions had dared to blossom. I thought I had been very diligent and chopped off not only the open yellow heads, but also the green buds, so where did these come from! Well, I may have won the first battle, but clearly not the war. Looks like this might rage on for a while yet. Categories: Light Hearted, Postaweek2011, Rants | Tags: Battle, Daffodils, Dandelions, Forsythia, Gardening, Light Hearted, Postaweek2011, War | Permalink.